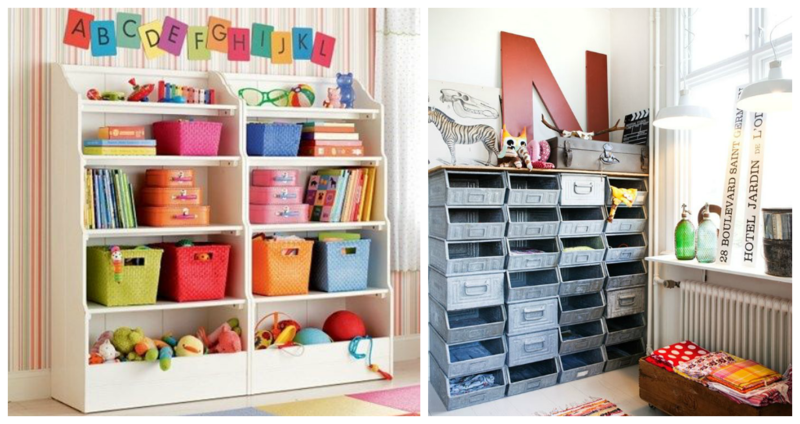 If you have limited space available for a child’s playroom here are two functional ways of decorating the playroom to maximize storage space for toys and games. 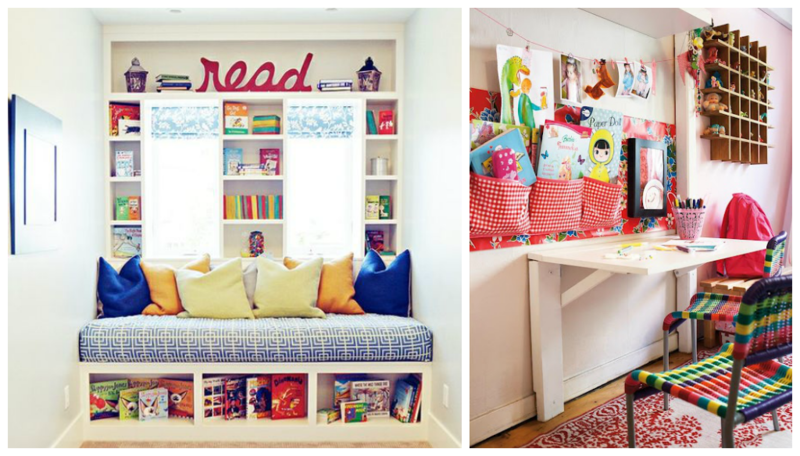 The first shows storage beneath the bench and the second a fold away table that can be popped-up for coloring and crafts. 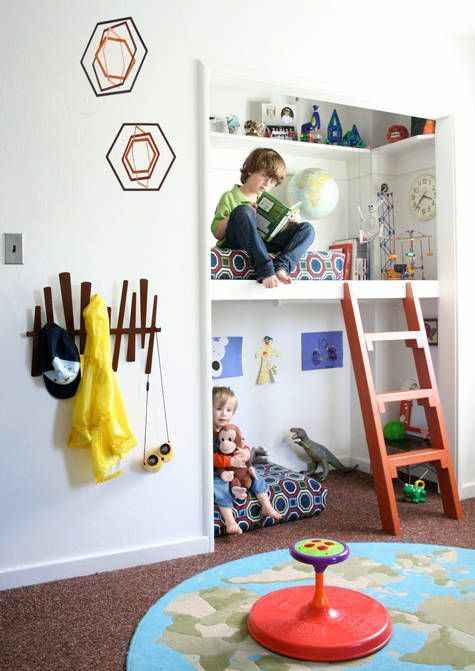 This original idea shows how a simple closet has been converted into a play area/reading corner. Keep the top shelf for storing toys and separate the rest of the space into two areas, the top accessible via a small ladder. These photos show inspired storage solutions that are sure to be a welcome addition. 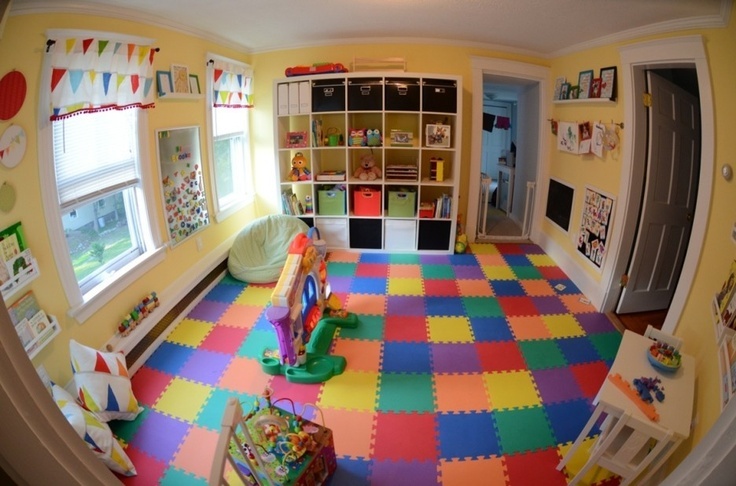 The variety of storage spaces will help children organize their corner to avoid the usual disarray and add a touch of style to give this area the desired look. Ease of access to the different compartments will encourage children to put things away when they are finished playing so avoid anything that’s too closed such as drawers. If you have the space, why not install a play module to keep active kids busy and give them a place to expend excess energy! A foam safety carpet underneath will not only keep them safe if they fall but will also add an inviting and colorful touch. 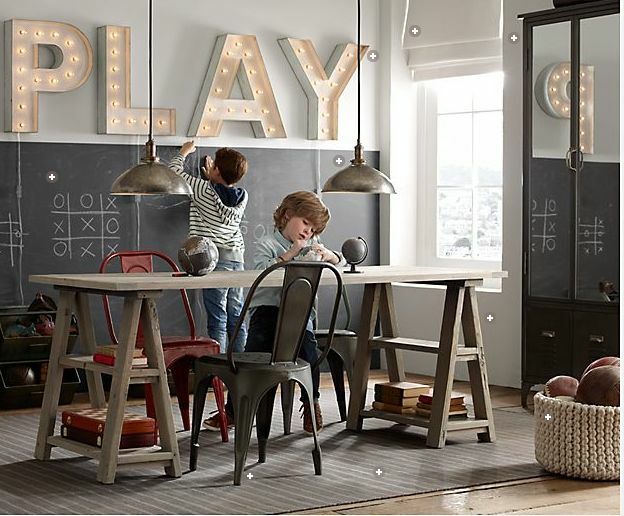 The perfect place for children to unleash their creativity! 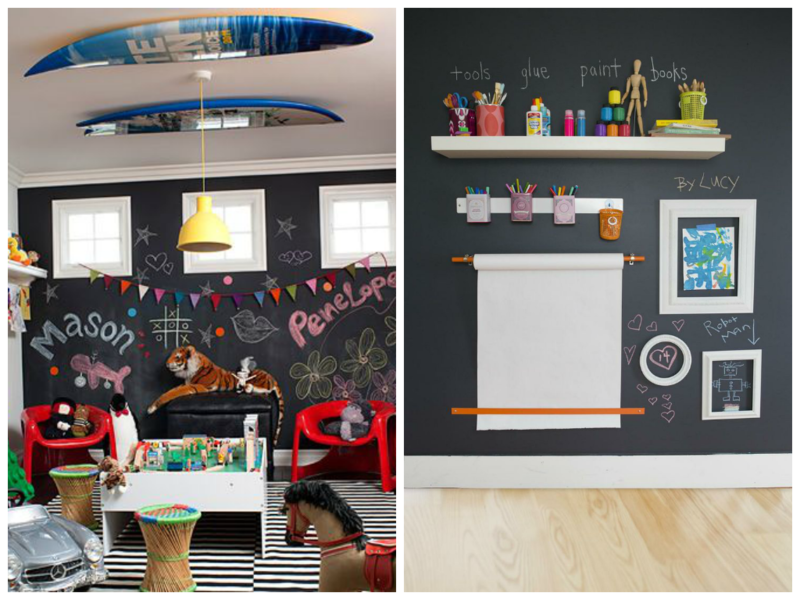 The artwork will create the decor while giving the little artists a place to express themselves, these two pictures may give you ideas for your playroom. If you want to spend as much time as possible with the little ones, why not bring the two areas together. The sofa and T.V. can also be used for play dates with friends who also have children. Storage is key to keeping this space both adult and child friendly and it should be decorated to create a warm and inviting ambiance for all! By placing the play area near a large window you will not only save on energy costs and let the children take advantage of the natural light. 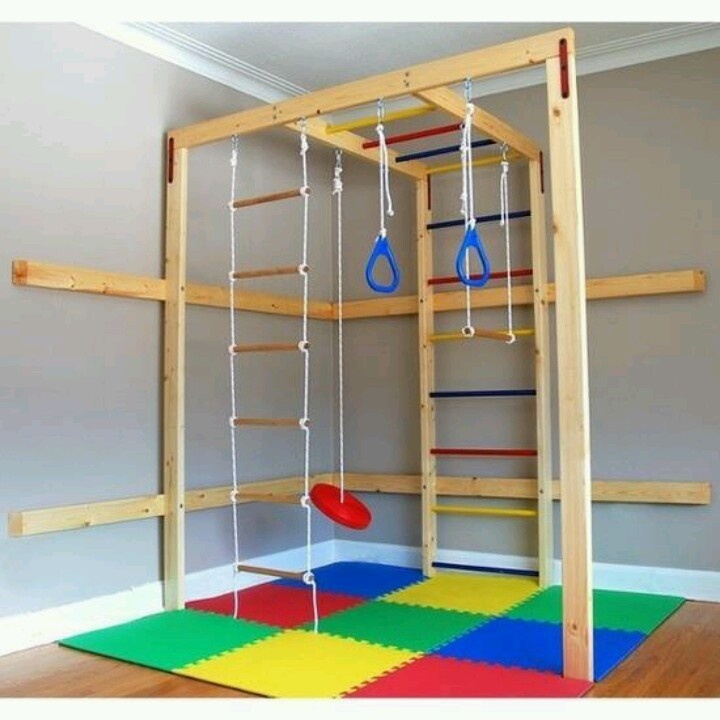 If your home reflects a contemporary decor, here is a wonderful way to continue the look through to the playroom. Industrial style furnishings, letters and a bright color such as red will create a very trendy look. Match lighting, storage baskets and shelves to tie everything together! 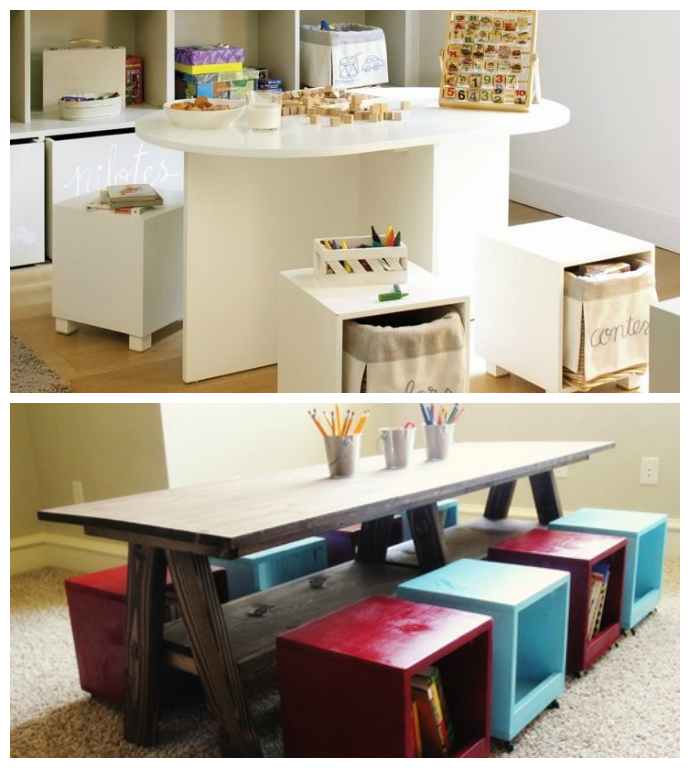 If you want a large table for crafts and other activities in the playroom, here are a couple of ideas that combine storage with seating to create place for crafts, coloring supplies, paints, etc. so that everything is in its place and easily accessible when the kids want it. To keep the little ones safe from the inevitable tumbles put in foam flooring. In addition to safety, these interlocking tiles will add a touch of color and give a playful feeling to the space. It’s not always easy to hide them but this is a good way to camouflage electrical cords in the playroom. 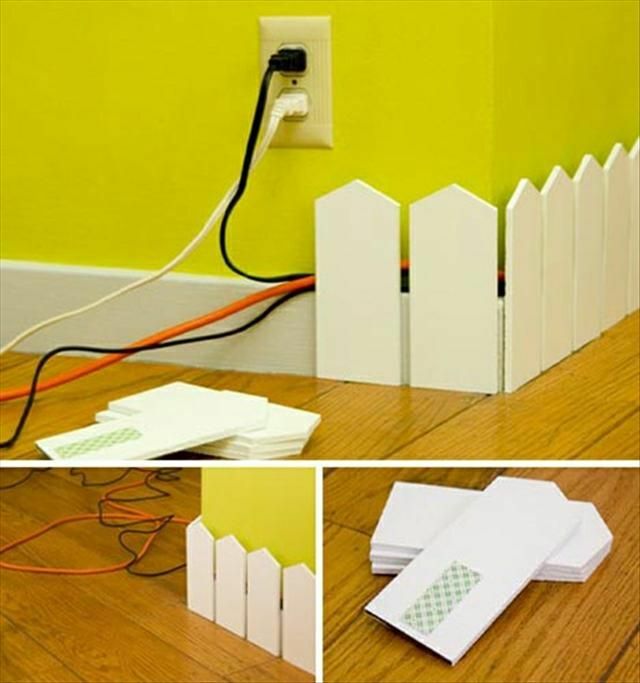 No need to making holes in the wall because this little imitation picket fence, stuck to the baseboards, will create a cute way to hide them and help to keep children safe in the playroom.